One of the four largest ceramics biennales in the world, the Taiwan Ceramics Biennale is curated by a Taiwanese for the first time in 2018. The curator is the internationally renowned ceramic artist Shao Ting-ju. Featured are 43 artists from ten nations: Taiwan, the US, Japan, South Korea, Canada, Switzerland, the Netherlands, France, Belgium and China. Their 80 artworks explore the links between creativity and the changing times. 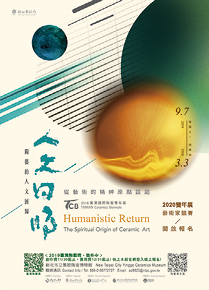 Taiwanese pioneers in the art community are joined by expert ceramists from abroad. We have also gathered some interesting loans from other major Asian museums. This year’s events are more engaging and appealing than ever. CAR→Exit Sanying Interchange on National Highway No. 3, pass over Sanying Bridge (in the Yingge direction), and proceed along Wenhua Rd. to public parking lot. BUS→Take Taipei Bus No. 702, No. 917, No. 851, No. 981; or take a Taoyuan Bus Co.bus to Yingge. TRAIN→Take a commuter train to Yingge train station, the museum is a 10-minute walk from the Wenhua Rd. exit.